The internet is a crazy place. These are some ways I can help. Client-side libraries like jQuery for interactivity. Server-side tools in the MEAN stack like Node, Express, and Mocha for testing, API access, data-mainuplation, and more. "I recently had the opportunity to work with Joseph...I found Joe to be positive, enthusiastic, and knowledgable as a team-member. He's the type of person who genuinely enjoys problem solving and I welcome the chance to work with him again on future projects." "Joe is a tremendous asset in a team environment. Right from the start of a project he takes an organized and thorough approach to his work. He is great at taking the lead to brainstorm ideas, organize tasks, assign duties, and identify goals. He quickly adapts to the dynamics of a new team and finds a way to build very productive working relationships with his peers. Joe kindly offers assistance to colleagues whenever he is able to shed light on a topic that someone may be struggling with. He has a terrific rapport with his teammates, as he is an excellent listener and always very willing to adopt any new ideas on which direction to take throughout the course of a project." "I had a very positive experience working with Joe. Not only does he have the ability to quickly grasp new material, when I needed help he displayed patience and understanding while explaining how the code works. He would be an excellent addition to any solo or group projects." When they reached out to me, PopSockets had just lost its dev team overnight. On the brink of a major product release. I did not have any experience with Liquid - the Ruby templating engine powering Shopify - or eCommerce. I had to jump into a huge code base, and learn several technical tools, very fast, at the same time. 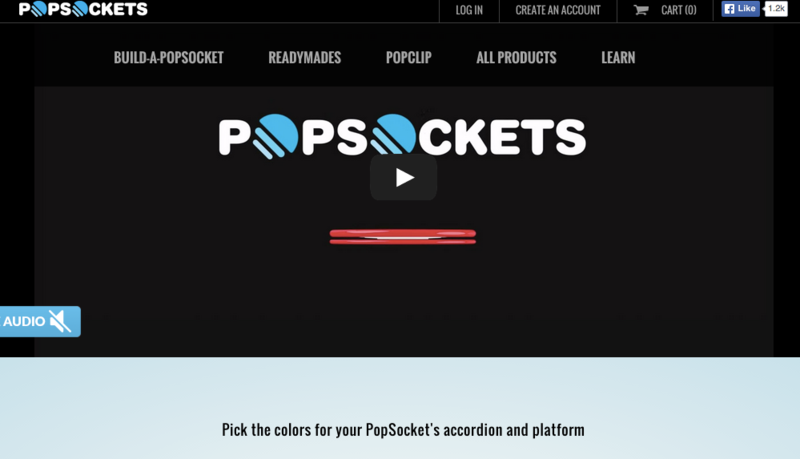 I first built responsive, indefinitely scrolling template for pre-built popsockets. It takes advantage of Flexbox. I implemented a "related products" section. First I had to allow the owner to build custom collections. The "related" partial then loops through the every collection the main product is listed in, and prints all of the other items in THOSE collections. The really cool part is that the loop does not print repeats. Even if a product appears in more than one related collection, the related section only displays that product once. I constructed roughly ten templates and partials while working with PopSockets. This also involved custom settings that allowed the owner to easily manipulate his shop after my contract was up. The first thing I learned was the basics of the Shopify platform and the Liquid templating language. Liquid is a lot of fun to play with, but its integration into an eCommerce has a learning curve. Fortunately the documentation in the Shopify community is extensive. I was production ready after building just a few toy sites for my own education. More than this, I learned about managing client expectations. Communicating set-backs with people that do not understand or care about technical intricacies is a very important skill-set. I constantly caught myself explaining something about the behavior of background images in the box model, which was a waste of both my time and my client's time. I also learned a ton about interacting with someone else's code. My web experience prior to this always began with a blank page. Here I was walking into almost 50 files, multiple front-end frameworks, and in some cases a real jQuery spaghetti. Being able to quickly navigate to the parts I needed, and familiarize myself with the parts I might need, was critical. I would absolutely be more careful about my own code legacy. I was careful to leave informative comments when I diverged from the prior style-guide. For example, I looked for opportunities to use flexbox for maximally responsive layouts. The prior designs did not make any use of flexbox, so I chose to be explicit about these choices. And yet I was making a lot of changes on the fly. I have a new-found empathy for "I'll add comments later..." In a production setting, especially under the gun of a new product launch, I had to iterate very quickly. I would make more time to be kind to the next developer, because I found myself wishing for better comments from my predecessor so often. Lastly, I would spend more time familiarzing myself with the code-base before diving in. I caused myself a lot of heartache by wrestling with pieces of BootStrap or my predecessor's grid system in the wild. Spending a little more time up-front to experiment with the technologies being used in isolation would have greatly expedited my later problem-solving. I met developer Eric Day at a board meeting for NorthWest Veg and offered to lend a hand with their website. I expected a small handful of static HTML pages, and got an amazing multi-lingual backend framework instead. I clear the dust to let Eric handle big projects (like building a DropBox emulator for non-profits) in peace. 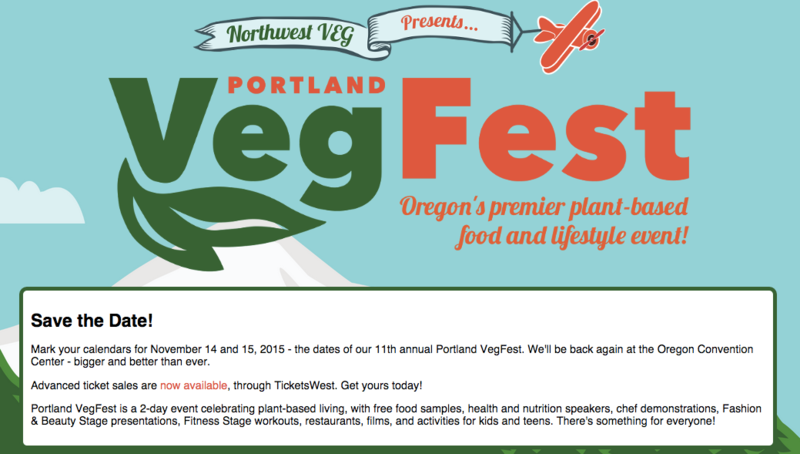 VegFest is one of the most important events of the year for NW Veg. It's important that there be a strong, intuitive web presence in place to advertise via social media. But the old designs were woefully outdated, including table based markup for layout purposes. We had to raze the old markup entirely. Eric had designed a custom templating language and a style-guide already, and begun to convert the site's history over to the new styles. I offered to take that project off his hands, systematically rewriting all of the markup sitewide to match his new designs. This also involved tons of link validation and general clean-up, but now it all looks clean, loads fast, and depends on strictly semantic markup. Sometimes in programming there are no short-cuts. You've just got to sit down and rewrite your old stuff, no matter how ugly it was. That said, you don't always have to physically type everything. I had fun writing some a mini search and replace tool to get the job done faster and avoid my own typos. CSS frameworks are worth the upfront learning curve. If you want to focus your energy on functionality, frameworks like BootStrap are indispensible for producing modern, colloquial styles without consuming your valuable development time. An explicit style-guide would have been worth the effort. The whole point of my involvement was to free Eric's hands, so guess-and-check was out of the question. This has been a consistent pattern of my early development: "man, we should have planned more clearly from the start..."
The divbuilder tool I made to expedite my work could have been generalized more. As it is, the function is barely useful even in this context. A few more hours could produce something more broadly useful. Open source contribution! But there are always more projects, and it was a useful exercise in documentation. Play with some slick jQuery libraries I'd been eyeing. I especially liked the idea of Theater.js being used with careful typography to produce a dramatic effect. Experiment with SEO and site promotion. The content of the site would be perfect: easily digestible, useful, controversial. Actually educate people on a philosophical issue that doesn't get much attention. This plug-in is one of the main toys I wanted to play with, so the first thing I did was tinker with the live example. I realized that in many ways I could translate that example code directly into my project. It's nice to see really good documentation, even for something so trivial. The other developer part of the project was finding an outlet for the site, and learning a little about SEO. I didn't devote too much time to SEO, since I'm hoping those skills will made obsolete as Google continues to improve its search algorithms. The hardest part was actually writing the content. Researching English grammar cases doubled the length of my project timeline. This was also the most important piece, since a boring site that failed to communicate its ideas would never get the traction I wanted. In truth, this is just a kind of documentation, but for using English rather than software. It's a good reminder the strong documentation is incredibly difficult to write. jQuery plug-ins can be fun and easy, and they have an unjustly bad reputation. Not all jQuery results in spaghetti, and puritanical programming doesn't mean good programming. You can have the technical skills to build something in three hours, but it may still take 30 hours to devise good content. Good documentation is as much about flow as clarity. The reader should be carried through your workflow naturally, and there should be intuitive ways to skip to an answer to their specific question. It makes sense to outsource the live poll functionality to a public API. Barring that, there should be a better database implemented. Jumping into the code without all of your content in place is sometimes necessary. But in this case I wasted time writing code that I would later obliterate as I refined my content. and whether we have common interests. I knew I would need to call a bunch of API's to synthesize that data from my online presence. My goal was to have the least possible markup, and the most possible useful information. A strong, simple visual hierarchy was crucial. But it's also a goofy idea, so I wasn't afraid to be silly. I also wanted to literally design mobile FIRST, rather than what many people do, which is design with mobile screens in mind. Secure, so that I didn't get my Google account hacked and ransomed for bitcoin. Fast, so that visitors wouldn't have to wait around for a hundred aJax calls to come back. Reliable, so that if Twitter was down or something the relevant elements would gracefully degrade. I learned almost everything I know about protocols and authorization on this project. OAuth2 is a huge topic in its own right, and I didn't initially realize the extent to which I would depend on it. API Keys are really annoying to juggle. Having a lot of apps accessing my server meant learning a whole new organizational model for my code. I want to incorporate more living websockets into the page, rather than isolated REST calls. Websockets are obviously the next step forward, especially for streaming feeds like Twitter. Having a paper outline is absolutely essential if you want to end up with organized, readable routes on your server. That would save a lot of confusion. Dealing with so many discreet APIs means budgeting a lot of extra time. They all have their own intricacies. You have to learn what the response object looks like for every single call you make. You have to realize that some people are still shipping XML objects...you have to dig into the documentation over and over again. I clearly underestimated how transparent groups like Google would be about their API uses. I studied philosophy at Western Washington University, and the University of Colorado, Boulder. I'm interested in everything you like. I'm not joking, no matter how obscure. I'm in this for Narnia. In addition to any of the links below, you can find me all over Portland. I frequent local meet-ups, and volunteer with various organizations, like Free Geek. This site was built using several front-end frameworks and development tools. These include Twitter Bootstrap, FontAwesome, the Bootswatch Paper theme, and others. It's hosted by GitHub using Pages. It is the creative product of hardwork by many people, but most directly by me. Please contact me with any comments, feedback, or questions. I am especially open to advice about making the site easier to use. Please join me in abstaining from chicken. You can learn about the unimaginable cruelty every individual chicken endures here . We can help stop their suffering together.